* Changed the emoji emoji stock by ONE, complete. * Changed most system icons and colored by indigo teal. * Nice and decorated the About, Lock and Hide Pattern colored the Chats. * Added Tick "Single Color"
* Changed sound output, input, recording chats. * Changed some icons the Launcher. * Changed widget icon "Hide Ultima Hora and indigo colored the Messages widget. Not know what else to escape but good if you use me see more stuff. Nairo mix - Material mods. 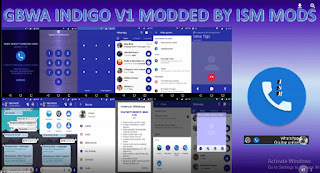 1 Response to "Whatsapp Indigo V5.60 Apk Latest Version download"
App not working.Just telling me that my time is inaccurate.I dont know what the problem might be.